Directed by a debutante director Aparnaa Singh, Irada is a flim starring Naseeruddin Shah, Arshad Warsi, Divya Dutta, Sharad Kelkar, Sagarika Ghatge in the lead roles. The story of the film is written by Aparna Singh, Anushka Rajan and is based on a true story of the city Bhatinda and its people. The film brings out ecological issues like uranium poisoning, reverse boring, and fertilizer poisoning in the city. The film is even set in Bhatinda with the Thermal Power plants and factories always lying in the background. The film depicts the story of an ex Army man (Naseeruddin Shah) discovers the cause of his daughter’s terminal illness is the result of carcinogens in the ground water from a factory, and a journalist loses her boyfriend who discovers the culprits behind the poisoning. The events take a turn when the CM hires an officer and he discovers a greater conspiracy. His struggle for a stable posting, better family life, and a clear conscience is one of the highlights of the film. The film’s music is composed by Neeraj Sridhar and the lyrics were given by Sameer Anjaan. The film also uses Urdu Shayari from Nawaz Deobandhi in some of the important scenes. The movie received good ratings from Hindustan Times, NDTV, and Box Office. The lead actors Naseeruddin Shah, Arshad Warsi were praised by the critics for their amazing acting and the director for her gripping way of telling a story. 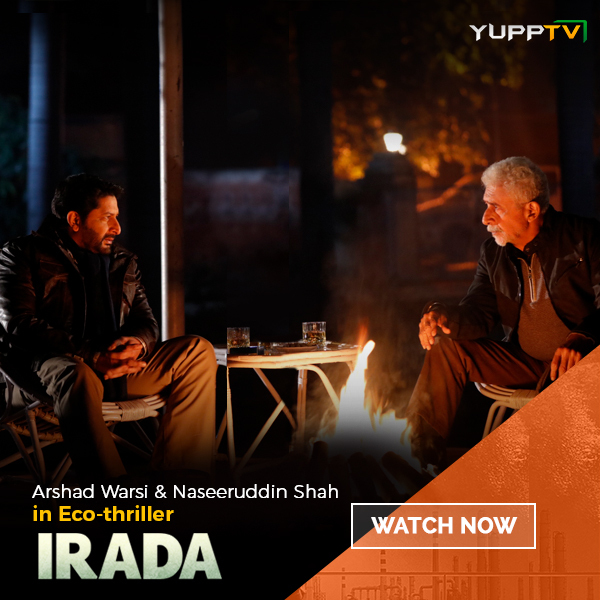 Watch the Internet premiere of Irada movie for a minimum price from the comfort of your home. The film can be watched on your Smart TV, Android/ Apple TV using your YuppTV account. YuppTV brings you the latest Hindi movies online via Mini Theater. You can also watch Indian movies online from different languages with HD quality on YuppFlix.